This article is for the fans of every other Pac-12 team. These are the fans that hate the Oregon Ducks, even though the reason is different for each and every one. The dislike could be caused by Oregon’s sparkling facilities and uniforms, winning streaks or notable victories (at the cost of an embarrassing defeat for another team). Here at FishDuck.com, we’ve decided to go through every team in the Pac-12 alphabetically and explain why they hate Oregon, while reliving some of the most treasured moments for Oregon Duck football. The 2007 Arizona win over Oregon, perhaps costing Ducks a trip to the National Championship, was a long time ago. Since then Arizona has beaten Oregon only twice, in 2013 (42-16) and in 2014 (31-24). The latter was avenged by Duck destruction in the Pac-12 championship game, 51-13. In 2008 the Ducks beat them by 55-45 on the way to the Holiday Bowl. In 2009 Ducks beat them in double overtime 44-41 before the Rose Bowl. In 2010 the Ducks beat them 48-29 on the way to a first National Championship game. In 2011 Ducks beat them 56-31 on the way back to the Rose Bowl. In 2012 Ducks beat them 49-0 on their way to the Fiesta Bowl. In 2013 Arizona beat Oregon 42-16 before the Alamo Bowl. The most bitter of these pills for Arizona fans was in 2009, when the teams came back to tie the game very late (just a few seconds remaining), and then beat them in double overtime. This might be categorized as one of Oregon’s Top 5 sweetest victories. Arizona hates Oregon because the Ducks beat them more often than not. They hate the Ducks for 2009, when they stormed the field early, only to watch their team lose after an amazing comeback in ’09. There are so many reasons to hate Oregon, and so many good memories for Oregon fans. 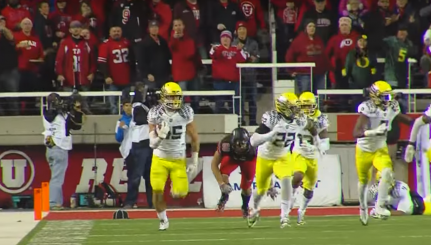 For Arizona fans, their collective memory of Oregon games is mostly depressing. 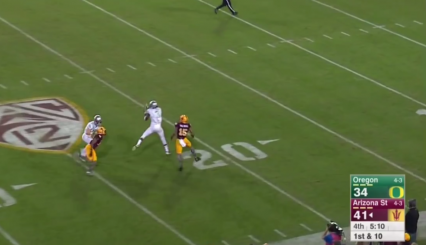 Charles Nelson ran away from the slow-footed Arizona State cover team. The last time the Ducks lost to Arizona State was 2004 (also the last time the Ducks had a losing season), 12 years ago! Granted, Oregon doesn’t play them every year, but still, the Ducks were 9-0 against them in that time period. The only team Oregon has beaten more consecutive times is the Huskies. In 2007 Oregon beat them 35-23 when they were ranked #4 in the country, but I’m guessing most of their fans don’t remember that. What they do remember is losing to the Ducks last year in triple overtime 61-55 by the ridiculousness of one Vernon Adams. After a back and forth first half, ASU looked like it would be pulling away in the third quarter. Oregon faced a grim outcome as ASU pulled a six-play 75-yard drive, putting them up 31-20 in the third quarter. Then Charles Nelson ran back the ensuing kickoff 100-plus yards for a touchdown, upping the score to 31-27. With Oregon’s game on the up-and-up, the team increased competition. The Ducks forced an ASU punt and calmly went 70-yards in two plays for another touchdown, on runs of eight yards and 62 yards by Benoit, changing the score to 34-31 Ducks. After kicking a field-goal to tie it up and forcing a punt, ASU went on a nine-play drive for a touchdown and a 41-34 lead. The team forced Oregon to punt again, and with time winding down in the fourth, left the outcome uncertain. Tyree Robinson’s pick turned the tide of the fourth quarter. As the pressure spread to Bercovici, he threw a pick to Tyree Robinson, setting up a 13-play 60-yard touchdown drive that took 4:50 off the clock and left ASU without time to respond. On fourth and goal with 23 seconds to play from the nine-yard line, Vernon Adams took the snaps and ran about 82 yards in a parabolic mystery. He ended his spurt at the 25-yard line, where, with two defenders in his face, he seamlessly threw the ball to Dwayne Stanford, who was standing at the back of the end zone. The play went down in Oregon football history. After trading touchdowns in the first two overtimes, the game went to triple overtime. 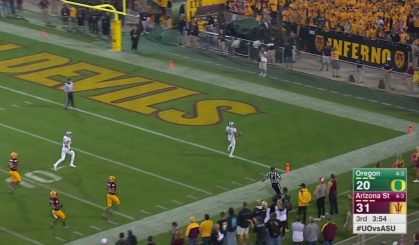 Adams threw the ball to the back of the end zone, reaching Bralon Addison, where he got one foot down … or did he? The refs ruled the play as a touchdown, and the video reply cut out his toe, because of a sideline camera blocking the view. In all honesty, his toes was probably on the line, but “thems the breaks,” ASU fans! Did he actually get a foot down? Who cares! Ducks win! 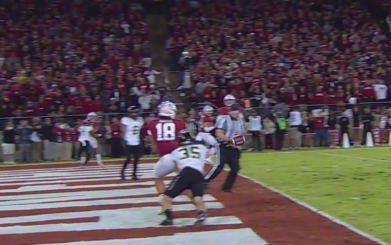 Oregon has to go for two, but Addison fumbles the snap and goes nowhere, 61-55 Ducks. The game isn’t over. ASU gets the ball and has second and goal from the three-yard line. The receiver thought he was running a slant pick play (act like you’re running a slant, rub the defender of another receiver). Bercovici thought he was running a slant, but as the receivers stop running, it’s a perfect slant … to Arrion Springs, who ends the game. Bercovici is crestfallen; the fans are stunned; Oregon is jubilant. For a great video summary of the game, go here. That game last season, plus a nine-game winning streak on the side of the Ducks, has left Arizona State fans feeling no insignificant level of animosity toward Oregon. Cal, where to start. How about when the Ducks beat them in overtime 27-20 in 2005? What about how the Ducks beat them in Eugene 42-3 in 2009, when they were ranked sixth in the nation? The game was only two games removed from the debacle at Boise State. Or how about the fact that they’ve currently beaten them seven straight times? How about the game in 2010 at Cal when the Ducks came in 9-0 and only scored one offense touchdown (Jeff Maehl) and another on a punt return (Cliff Harris) to win 15-13. Or the fact that Cal’s kicker stutter stepped resulting in an illegal motion penalty negating a made 24-yard field goal, and then missing the re-kick from only 29-yards! The Ducks gave them Jeff Tedford however, and he made them not mediocre for a while, so they can’t hate the Ducks that much, can they? Cliff Harris was fun to watch in the open field, unless you were a Cal fan. The Ducks haven’t lost to them since they joined the Pac-12 (four straight wins) but that’s not really a reason to hate the Ducks since they’ve been terrible forever. I’ll write this again in five years and have a good reason then. I will remind any Colorado fans reading this that the Ducks dropped 70 on you in 2012, so there’s that. So, so, so many reasons. As this topic has been covered at great length on many websites, so I’ll just hit some recent highlights quickly. The Ducks lead the series 63-46-10. The Ducks haven’t lost to them since 2007 (eight straight wins). In 2008 the Ducks kept Oregon State out of what would have been their first Rose Bowl in 44 years beating them 65-38 setting the record for most points scored by one team in the series. In 2009 the winner would go to the Rose Bowl and guess who won 37-33? Ducks. This included Jeremiah Masoli running over a hapless Beaver defender late in the game on fourth down: so money. Did I mention that pretty much everything about Oregon football is better? Uniforms? Facilities? Mascot? They hate the Ducks as only a scrawny younger brother can, with bitterness. 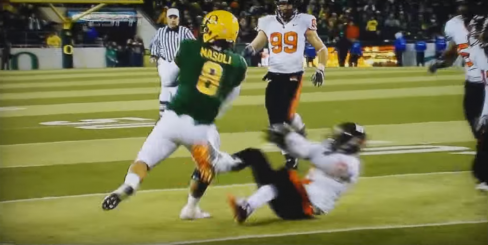 Masoli ran over Oregon State’s Mitchell, spun, and got the fourth down. Over the past 14 years the Duck’s record against Stanford is 11-4. In 2010 the Ducks destroyed the then ranked 9th Trees 52-31 as they began to learn all about Chip Kelly’s offense. In 2011 they were ranked 4th in the nation when the Ducks beat them 53-30, as they learned about the Duck’s offense a little more. Andrew Luck had no answer for the blur. While they did beat the Ducks in both 2012 and 2013 this was avenged in 2014 with a 45-16 beat down at the hands of Mariota, who threw for two touchdowns and ran for two more. In 2015 the Ducks crushed their playoff hopes with a gutsy 38-36 win on the road. It really helped that Kevin Hogan botched not one but two snaps that the Ducks recovered. It was also nice to watch them lose on the final play of the game, a 2-point conversion, when Joe Walker dove with an outstretched paw to knock down the pass. What can the Ducks say? Crushing dreams is what they do. Joe Walker with the diving block to preserve the Duck victory. The last time the Ducks lost to UCLA — unrelated to the Duck’s quarterback being out — was 12 years ago in 2004. The Ducks also lost to them in 2007 after Dennis Dixon’s knee went kaput against Arizona and they lost the last three games of the season. Besides those two loses they’ve beaten UCLA seven times. In 2011 the Ducks won their first Pac-12 Championship beating them 49-31 at home. In 2013 the Ducks beat them when they were ranked 12th in the nation 42-14. In 2014 when they were ranked 18th the Ducks beat them 42-30. Besides 2004 and 2007 UCLA fans only know losing to the Oregon Ducks. UCLA fans cheered the day Utah and Colorado were added to the Pac-10 because it meant they wouldn’t have to play the Ducks every year. The Ducks also beat them in 2003, 2002, and by one point when they missed a field at the end of the game in 2001, I was there, it was a beautiful thing to watch at the Rose Bowl. Outside of two years, one with an asterisk because of the Duck’s quarterback, all UCLA fans know when it comes to Oregon Football is despair. I would hate the Ducks too, but probably I’d just feel a sense of futility. In 2005 USC was ranked #1 when the Ducks played them and they beat the Ducks easily. The Ducks were not yet in their class of football. In 2006 they were ranked 7th and they beat the Ducks by 25. In 2007, before Dixon’s knee was ruined, the Ducks finally overcame the giant and beat the 12th ranked Trojans 24-17 at home. In 2008 they were ranked 9th and they crushed the Ducks once again. By now you’re thinking “hey, when is he going to get to the part about why USC fans hate us?”. That point is now my friend, it started in 2009 when the Ducks crushed #5 ranked USC in Eugene 47-20 on the Ducks way back to the Rose Bowl game. This was the year that Chip Kelly’s offense overcame the USC juggernaut with a complete dismantling. They couldn’t keep up, not even close, the second half was a track meet and the USC defense looked like they were playing in lead boots. 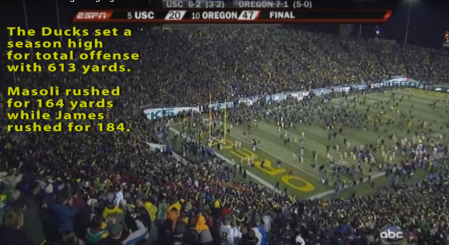 In 2010 the Ducks beat them 53-32, in 2012 the Ducks beat the 17th ranked Trojans 62-51. In that game the Oregon offense tallied 730 yards and 62 points, the most ever allowed by USC (which began playing football in 1888). Kenjon Barner had 321 yards and five touchdowns! This was a beat down of historic proportions. They did just barely beat the Ducks 38-35 in 2011 when the Ducks missed a 37-yard field goal. But that was season the Ducks went back to the Rose Bowl and beat Wisconsin and the Ducks have owned this decade thus far, tacking on another 48-28 win in 2015. USC fans hate the Ducks because they have been humiliated by a team they never thought would challenge them, a team they could count on for a win against nearly every year for decades. They hate the Ducks for stealing De’Anthony Thomas. They hate the Ducks for making them feel despondent watching us regularly put up 40+, 50+, even 60+ points on their four and five star defenders. Yes, the hatred runs deep in this relationship and it’s something I relish with joy. 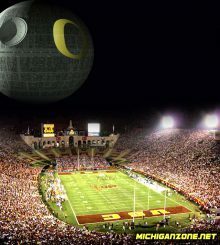 The Duck Death Star came often to the Coliseum and wreaked havoc. Utah joined the Pac-10 in 2011 but the Ducks have only played them three times. In 2013 the Ducks beat them 44-21 and in 2014 the Ducks beat them 51-27, when they were ranked 17th. Last year they beat the Ducks so badly I can’t speak of it in this article, though I have in others, likening the Ducks to a high school football team and the Utes to well, the Oregon Ducks. So since joining the Pac-10 the Duck’s record against them is 2-1. Hardly a reason to hate the Ducks. In 2014 they were up 7-0 when Kaelin Clay caught a long pass and headed towards the end zone, only to drop the ball 1-yard short. Joe Walker calmly picked up the ball and ran it back 100-yards to tie the game. Instead of a 14-0 lead it was tied and the Ducks went on to win 51-27, scoring the final 21 points unanswered, after Utah got within a field goal in the fourth quarter. Mariota had three passing touchdowns and one running. Maybe they hate the Ducks because of that loss. The Ducks also beat them 31-24 in 2009 when they were ranked 18th, so there’s some earlier history of angst also. Joe Walker picked up the dropped ball and ran it back 100 yards for the TD. 12 straight years of losing to the Oregon Ducks, ’nuff said. A decade. If you grew up in Washington and are now in your junior year at the University of Washington, since the third grade all you’ve known is that the Oregon Ducks have dominated the Washington Huskies. Wait, and The Pick. If you don’t know what I’m talking about then please take the next 15-minutes and Google these things. You should also check out this Twitter account, The Last Time UW Beat UO. Oregon leads this series 49-7-39 all time, with the Cougs’ winning last year in double overtime. I put an asterisk on that game however, as the Ducks were without their starting quarterback Vernon Adams. Since 1985 Oregon has only lost to the Cougs’ eight times out of 29 tries, which is a 78% winning percentage. 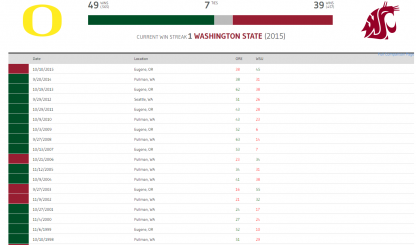 All the green bars indicated Oregon wins. That’s 30 years of Oregon winning three out of every four games, or eight out of every 10. Until last year the Ducks had won eight in a row against the Cougs’. Basically, outside of a few games here and there, they’ve been one of the Ducks favorite punching bag for decades. That’s plenty of reasons for Coug’ fans to hates the Ducks, and plenty of happy memories for Duck fans. In summary, although much of this hatred can be attributed to Oregon’s rise to the top of college football (something I wrote about here last year), we can definitely point to a key game or games, or a particularly disheartening Oregon win streak. Sometimes it’s because the Ducks played foil to their dreams of grandeur. The Ducks kept someone out of a bowl game, kept them from a winning season, kept them out of the Pac-12 championship game, or dropped more points and yards on them than anyone in the history of their program. Whatever the reason I think I speak for all Oregon Duck fans when I say “we understand”. We too have been the league punching bag. We too have had long losing streaks against multiple teams. But for a while now Oregon football has been on the other side, the dominant side, the side that makes everyone else in the Pac-12 hate the Oregon Ducks.